First off is one of my favourite tanks, Umbreon. This pokemon can't do anything by itself. But, it can take lots of blows and heal your team members (0r, sit out while your opponent slowly loses it's health). So for this one you'll want to have it's health and sp. def maxed out (with EV's) and have a calm nature. If you combine this with curse it'll be untouchable in both it's defence and special defence. For it's nature we'll go for a Calm or Sassy nature. I think sassy might be best as we're going to lower our speed stat anyway. For it's ability there are two options, synchronise and inner focus. Synchronise lets all status ailments inflicted on you get passed on to your opponent as well (this is great for a tank like Umbreon). Inner focus prevents you from being flinched. While inner focus can be handy against pokemon that use flinching (or worse, paraflinching) to keep you at bay it's far less flexible than synchronise. So, synchronise it is. What I want to do is be able to attack my opponent and heal myself and my teammates. Wish allows me to heal myself or my teammates (hint: Baton Pass in to a pokemon holding a quick claw to neglect the speed decrease from Curse). It's tempting to use moonlight instead for an instant health boost but that doesn't allow me to heal my team members (but if you're running a sunny day team and using Umbreon more offensively you do want to use Moonlight). Umbreon isn't a good attacker so I don't want to rely on having to sit things out with him. But to prevent us from being hurt during the turn we use wish we'll use protect. To attack your opponent you have two options. Either payback or foul play (you can use toxic too but that's more for if you're intending to keep Umbreon in play longer). Payback is mean because you're slowing yourself down with curse while having a low speed stat to begin with. This almost guarantees that you'll hit last and get double the power out of payback. Foul play however is more useful the more powerful your opponent as it hits with your opponents attack. However, this isn't as reliable so it's not my cup of tea. There, that's Umbreon. You can either play it safe with curse, baton pass, wish and protect (but that'll make you vulnerable for taunt). Or you can switch out protect for payback or foul play to deal some damage too (oh, and give him some leftovers so he'll last longer). Now it's time to tart dealing some damage with Espeon. Espeon doesn't have the HP or defensive capacities that Umbreon has. But it does have a mean speed and special attack stat. He's going to be our teammate for Umbreon. We don't want his speed suffering from Umbreon's curse, so we'll give him a quick claw. Because of that we don't need to invest in his speed stat so he'll have a Modest nature. His nature magic bounce, is wonderful too. It reflects non damaging moves back at it's user (no roar for our friend here). There are two options for Espeons move set, he can either be used to support other team members using moves like reflect and light screen. But we're pairing him with Umbreon so we don't need anymore defence or special defence. Instead we're using little guy as an attacker. Psyshock is going to be our STAB move. The other moves are a bit more complicated. We can either use calm mind to raise it's sp attack a bit more, then use grass knot for monsters like Tyranitar and baton pass out to escape from too big threats while passing on our boosts. Or we can go even more offensive with protect instead of baton pass and a fire hidden power. 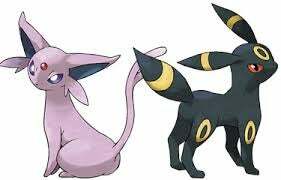 There you have it, the supporter Umbreon and attacker Espeon. I'd love to know what you think of this combo and how you'd use them.